scottleffler.com: Bird war gets political! OMFG! I can't believe it. 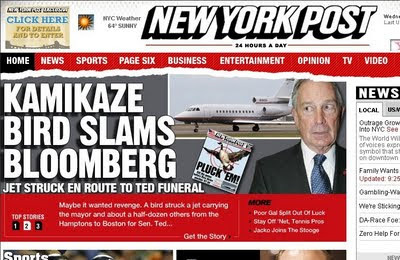 The birds are at it again, this time attempting political assassination of New York City Mayor Michael Bloomberg. Now, you may call the "bird strike" mere coincidence, but it was Mayor Bloomberg who ordered the execution of hundreds of Canada Geese following the takedown of flight 1549 back in January. The mayor, a pilot himself, did not comment.